WhatsApp Text Tricks To Change Font Style: If you are searching for WhatsApp text formatting tricks, then you are at right place. WhatsApp added new features in its every update. That’s why There are a lot of WhatsApp Tricks and Cheats available. Some text formatting options are available in the official WhatsApp application. Also, with third-party font stylish apps, you can change the color of WhatsApp messages. So, in this article, we are writing about WhatsApp writing tricks to improve your chat experience with the official WhatsApp application. There are many modded versions of WhatsApp Applications are available like GBWhatsApp, WhatsApp Plus, and YoWhatsApp. Most of the users use these 3rd party apps for more features. Because these apps provide more features than official WhatsApp. However, Some users don’t use these apps because of privacy concerns. Also, with modded WhatsApp, you can change the fonts only on your phone. But, here we are writing those WhatsApp typing tricks, with that, you can change WhatsApp font and text style, and your friends will receive the changed fonts. WhatsApp allows its users to highlight their message in Bold, Italic, Strikethrough, and Monospace format. Because, these features provided by WhatsApp itself, your friends will receive the messages in bold, italics, and strikethrough. However, you can change the font size, but, this option is only for your chat screen to adjust the size according to your requirement. It won’t affect the messages you sent. You can highlight your message with the Bold format in WhatsApp. The bold text is darker and heavier than normal text. This feature is provided by WhatsApp. It doesn’t matter whether you are using Android Phone or iPhone. It works on all devices. To send bold text in WhatsApp, you need to Write a message in asterisk (*) symbols like *Hi, how are you*. When you write your message in asterisk symbols, your message will automatically appear in bold format. Alternatively, You can bold your messages by selecting the message text. Write a message, and tap and hold on it to select the text. After that, you will See the B icon on the top. Tap on the B option to convert your text in bold format. This feature is also provided by WhatsApp to send a message in Italics format. Basically, Italics slants the text evenly to the right. You can use this feature to highlight your messages. This method works on both iPhone and Android phones. To send Italics message in WhatsApp, You need to write your message in underscore (_) symbols like _Hi, how are you_. So, after inserting your message in underscore symbols, your message will automatically appear in Italics format. Alternatively, You can italic your text message by selecting it. To do this, write a message and tap and hold on it to select the message text. You will see the I button on the top. Tap on this I option. And you selected message will be in italic format. You can also send a WhatsApp message in a Strikethrough format on Android and iPhone. Strikethrough is a text with a horizontal line through their center. However, Strikethrough is used to mark a text as a recently deleted. But, this is another option to highlight your message in WhatsApp. To send a message in Strikethrough format, you need to write your message in Tilde (~) symbols like ~Hi, how are you~. After inserting a message in Tilde sign, Your message will automatically appear in Strikethrough format. WhatsApp recently added this option. Now you can also send your message in monospaced fonts on your iPhone and Android phone. Well, In Monospaced fonts, the text and characters occupy the same horizontal space. But, you can use this option in WhatsApp to change the font style in WhatsApp. To send a message in monospaced fonts, you need to write your message in three backticks (“`) like “`Hi, how are you“`. After writing a message in three backticks, the message automatically shows in monospaced fonts. You can also change the font size in WhatsApp. WhatsApp allows its users to change the font of chat according to their requirement. So, there are three sizes of fonts in WhatsApp application. 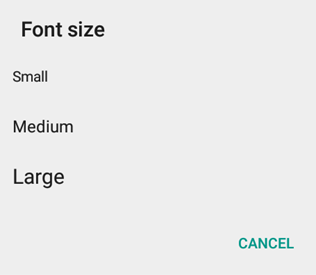 You can set Small, Medium and Large font sizes in Whatsapp. You can do this on both Android and iPhone. Open WhatsApp and Go to Settings > Chat > Font Size. And choose font size. By default, The Medium font size is set. Go To your iPhone’s Settings > Display & Brightness > Text Size and change it. For larger size Go to iPhone Settings > General > Accessibility > Large Text and enable it. So, these tricks are available in the Official WhatsApp application. But, there are also third-party apps in Google Play Store to send WhatsApp message in blue color and you can also change a font in WhatsApp. Well, you need a third party app to change fonts in Whatsapp. There are a lot of apps in Google Play Store to change fonts. Some WhatsApp users are also searching on the internet, How to Underline text in Whatsapp? So, with these third-party font stylish apps, you can underline and change text color in WhatsApp. Also, there are various fonts available in these apps. Download “BlueWords” app from Google Play store and change the fonts. You can also send a message in Blue color with this app. Below is the link to download this app. Open the app and select the font style. After that, type a message in a font changer app and copy your message and paste in WhatsApp. So, guys, these are the WhatsApp Text Tricks to change the font style. These methods are safe and secure. Also, there are many third-party apps available for Text formatting. Moreover, you can install GBWhatsApp. GBWhatsApp is a third party version of WhatsApp for more features. Though, many users don’t trust on modded versions WhatsApp. So, these Text tricks are useful for many users.